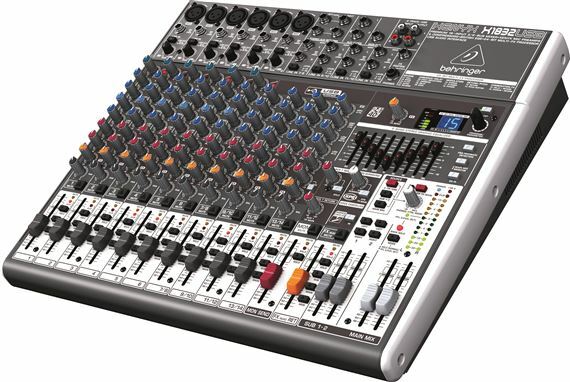 Building on the feature set of the X1622USB, the Behringer XENYX X1832USB USB Audio Mixer comes with two additional mic strips for a total of six XENYX mic preamps. 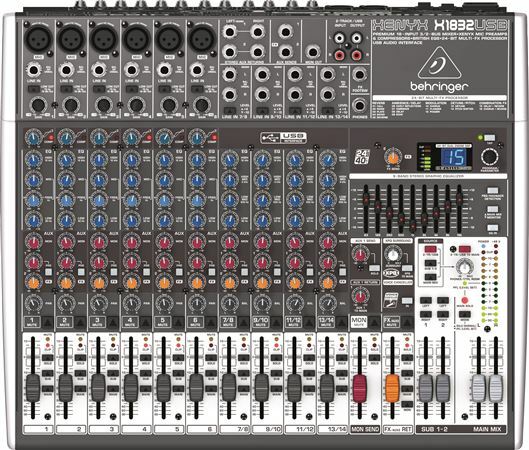 Building on the feature set of the X1622USB, the Behringer XENYX X1832USB USB Audio Mixer comes with two additional mic strips (including channel inserts), for a total of six XENYX mic preamps. The onboard stereo 9-band graphic equalizer, which can be assigned to the main or monitor buses, provides superb system EQ and works in conjunction with the FBQ feedback detection circuitry to eliminate annoying mic squeals. 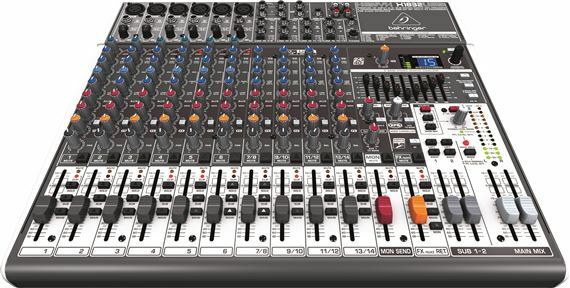 Other features include full-sized faders for MON and FX SENDs, along with Behringer’s proprietary XPQ 3D stereo surround effect and Voice Canceller. The ultra-versatile X1832USB also has an additional Aux Send (switchable pre/post), for a total of three, and two assignable subgroups. The British consoles of the 1960s and ‘70s changed the sound of rock and roll—without them the British Invasion might not have happened. Those legendary mixing desks soon became the envy of engineers and producers all over the world. The channel EQ on Behringer XENYX mixers is based on that very same circuitry, allowing you to imbue signals with incredible warmth and detailed musical character. Even when applied generously, these equalizers exhibit sweet forgiveness and superb audio quality. Ask professional sound engineers what their favorite piece of external processing gear is and the majority response will be virtually unanimous—dynamic compression. What is compression? We’re glad you asked. Compression essentially limits the dynamic range of a signal, lowering the level of loud sounds and turning up softer sounds, to achieve sonic balance. But applying compression is a delicate art that many novice and even intermediate, sound techs have great difficulty mastering. The “one-knob” compression is available on all mono channels and is easy to operate, even for entry-level users. With this one knob, you can easily dial in the perfect amount of compression for instruments and vocals, creating powerful mixes with punch and clarity. This is indeed a rare feature for products in this class—but standard on all XENYX USB mixers. All XENYX USB Series mixers (except the 1204USB) feature Behringer’s new 24-bit dual engine FX processor, with 16 editable, studio-grade presets including reverb, chorus, flanger, delay, pitch shifter and multi-effects. Complete with a highly accurate input meter, these effects can be altered to your personal taste via the Parameter control. Time-based functions can be entered manually by pressing the Tap button in tempo with the music. 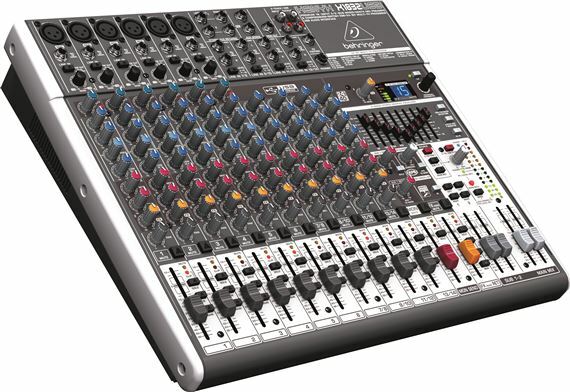 Because you’ll want to take full advantage of the XENYX USB Series mixers’ recording and podcasting potential, Behringer has thrown in a massive software package that includes Audacity (the most popular open source audio editor), Podifier, Juice, Podnova and Golden Ear (a great selection of podcasting software). You’re ready to go live on your PC or Mac computer right out of the box! You also get more than 100 virtual instruments and 50 FX plug-ins, turning your computer into a complete home-based or mobile recording studio from input to output. When you’re ready to take your recording projects to the next level, XT Software’s energyXT is just the trick. This amazing DAW (digital audio workstation) makes it easy to manipulate your audio and MIDI files, turning song ideas into stunning CD or Web-ready recordings. energyXT includes its own multi-FX processor, plus a built-in synthesizer/sampler and a drum machine, both of which can be accessed directly via an external controller (such as our UMA25S) or programmed in step-write mode. No matter what your audio mixing needs are, BEHRINGER USB Series mixers provide the performance and features that can take your talent to the next level, at a price that is sure to amaze you. Try one on today—AMS has one available in your size! Amazing player well worth the money . Player fits perfect with the rest of the equipment .. Perfect for a Small band. Perfect mixer for a small band with bass, guitar, keyboards, drums, and a few vocals. Bought this and the EP2000 power amp instead of a powered mixer. From the on board compression to the channel inserts, to the 2 sub outputs there is so much more flexibility. Enough channels for the band. Drummer and Keyboardist can always run their own mixer into this board if more channels are needed. So far, so good. Awesome features and great sound. Hands down, the best mixer in this price range. Everything seems fairly well built and sturdy. Knobs and faders don't feel flimsy at all, as with other mixers I've seen in this price range. Totally happy with this product! Aside from a few minor things, like the left side cover on my unit seems to have a slight gap at the top, unit is of decent quality. The unit is fairly easy to understand. Knobs are labeled and color coded for easy ID. I love the 9-band graphic EQ. The feedback detection system is a must for live shows! Mic pre-amps sound great! British EQ on every channel! Need I say more? Haven't had the unit but a week. So far so good. I've had other Behringer gear before. As long as you take care of it, it should take care of you. The mixer have all the features you need from EQ, Effects, Compression and others. I was truly impressed with so many features for the asking price. I have used this mixer for two years and I had it up and running right out the box. I have not touched the manual, it is laid out in a simple format with very easy to understand markings. The sound impressed me the most because I thought with such a low price the sound quality will be medium quality. However, I was blown away when I heard the sound, my system sounded like it was playing through a million dollar board. I am thoroughly pleased, I think Behringer exceeded their expectations. If you want quality at a low price, you should buy this mixer and I guarantee it will exceed your expectations. A no brainer, great price, excellent sound, and well built. The mixer is built verywell and should last thru the roadies.But it is electric! preamps are well made,nobs seam solid,size is perfect,effects good. I read the manual and no problems,works well with bbe88i and dod231 equalizer. The tone can be set like all mixers ,I use A BBE88i balanced and a equilizer too so all it has to do is mix works great for what I need. had it forty days and nights hasnt sunk yet our leaked sound from anyware,our no bleed through. Im not going to need a different brand for awhile. Gator GMIXL1618A Lightweight Mixer Case 16.5" x 19"x 6"